Engaging in outbound sales means you can target the exact type of customer you want, rather than waiting for them to discover your brand, engage with your content, and request a consultation. On average, 43% of annual revenue is derived from outbound marketing. Clearly, mastering outbound sales strategy is essential to the success of your business. Outbound sales techniques are extremely powerful tools for business development, especially for small and growing companies. In our guide to new outbound sales strategies, the key components include building accurate prospecting contact lists, developing a strategic approach, and executing repeatable sales processes to reach decision makers. After identifying your ideal customer, the next step is to create targeted segments by market. You can split up your segments based on value, need, region, job title or even industry This strategy will allow your sales team to develop outreach that confronts the specific needs and preferences of each customer segment, which will improve overall rapport and eventually increase close-rates. After segmenting your audiences, your organization will have the ability to refine your messaging, customize your approach, and over time, your sales team will have the opportunity to establish themselves as thought leaders in the industry. Taking the time to perfect and differentiate your approach to specific segments will eventually lead to more revenue. The more segmented you are, the more personal you can be in your approach- ultimately leading to a more successful outbound sales strategy overall. How do you determine whether the sales strategy you have in place is effective? It really comes down to developing KPIs (Key Performance Indicators). Implementing a new strategy becomes useless if the success isn’t measured month over month with proven improvements or declines. Tracking metrics such as these will enable you and your sales team to gain visibility into how outbound sales activity is performing. 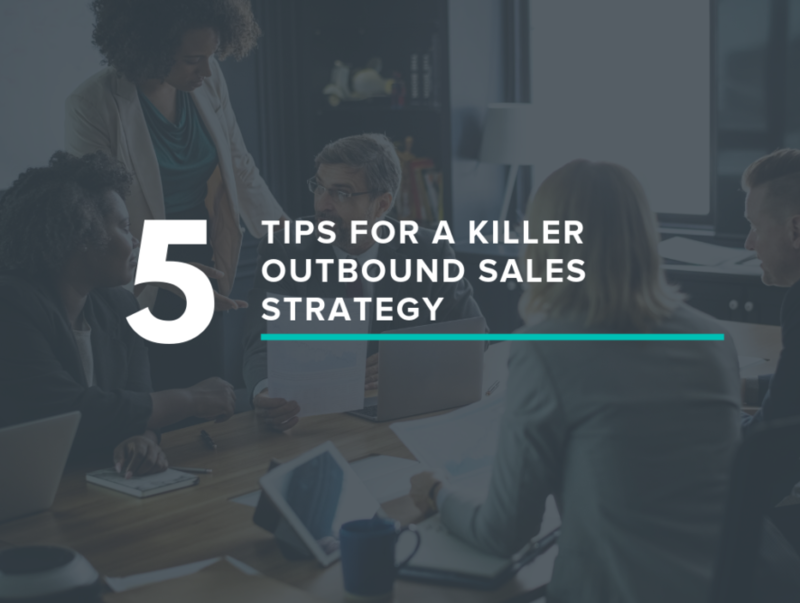 By keeping up with your success and optimizing your outbound sales strategy along the way, your business will have a healthy pipeline filled with future opportunities and continued growth. In order to set a standard objective, use data when measuring KPIs. The benchmark created should be based on data and information form your sales history or industry-wide benchmarks if you are a startup. Many organizations prefer account-based marketing, a strategy that targets groups of decision-makers rather than a single lead in order to build brand awareness and continuity. The theory behind the idea is that if the right decision-makers are aware of your product, the company is more likely to close. The goal is to yield higher revenue from fewer clients, so how do you execute this? After determining which channels are best to optimize through this approach, you can begin to execute a targeted campaign. With the use of the correct technologies, sales teams now have the ability to coordinate ABM campaigns more effectively and at a greater scale. This one may seem obvious, but you’d be surprised at the number of companies that don’t use inbound efforts to bolster their outbound sales strategies. Outbound and inbound marketing don’t need to be entirely separate. In fact, these two types of marketing are meant to feed off each other in order to avoid duplicating efforts and wasting time on either side of the business. In a recent Act-On and Demand Metric study completed in Q2 of 2016, less than 20 percent of mid-size B2B companies relied solely on inbound or outbound strategies; 84 percent of respondents used some mix of both. Don’t hesitate to work off the momentum created from the inbound team- take full advantage of all the blogs, webinars, eBooks and other content your marketing team is developing. Inbound efforts will increase the likelihood of a prospect being truly interested and informed before even coming in contact with the sales team and in the long-term, you will see an improvement in lead qualification. Consequently, the higher quality of leads will hopefully mean a decreased sales cycle as well. Research suggests it takes as many as 12 touchpoints before engaging a meaningful sales conversation. In order to remain productive and see results from your outbound sales strategy, you must make each touchpoint count. So, how do you stand out from the competition? To start, you should begin utilizing the content your marketing team is creating such as case studies, white papers, and eBooks, and you should stop only talking about yourself. Rather than telling prospects about who you are and what you have to offer, provide them content that shows that you understand their pain points to invite a conversation. From there, you can demonstrate how your business can eliminate their problems. Do your research for qualified accounts and stay up to date on who won awards, got a promotion, or announced a new partnership and include those shifts in your outreach to prove your interest in their business. To help, take a look at some of our tips on how to better improve your prospecting emails. Utilizing a tool such as Winmo to report on every time a company has a shift to their demographic, agency line-up, product offerings, and media mix will enable your sales team to personalize their outreach and approach at precisely the right time.